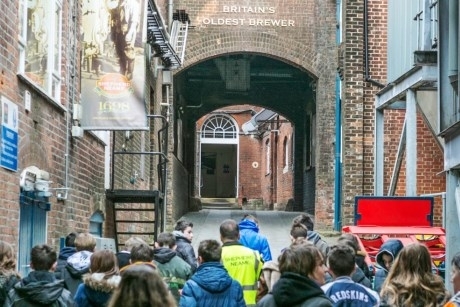 Shepherd Neame Visitor Centre in Faversham in Kent is now offering educational guided tours of the working Faversham Brewery site for students aged 14 and over. Designed to complement studies in Biology topics such as micro-biology and fermentation, as well as in Business Studies, Marketing, History and Geography, the Faversham Brewery tours provide students with an opportunity to learn about the ancient art of brewing. Pupils will also be able to see brewing and fermentation vessels, taste natural mineral water from the brewery’s well, try malted barley and smell locally grown Kentish hops. The 80-minute tour also includes a visit to the Old Brewery Store, housed in the site’s old wines and spirits store, which features displays of historic delivery vehicles, a recreated cooper’s workshop, bygone pub signs and a collection of hop picking memorabilia. Shepherd Neame also has a commitment to responsible retailing and education and so as part of the visit to the brewery it also provides a short presentation on sensible drinking to students. The educational tours are available throughout the school week. What else is available for schools in Kent? School groups can combine a visit to Shepherd Neame Visitor Centre with a trip to the Canterbury Tales visitor attraction. The Canterbury Tales visitor attraction is an opportunity for students to learn about Geoffrey Chaucer, the famous poet and author of The Canterbury Tales. Pupils will also be taught about the band of pilgrims who journeyed from The Tabard Inn in London to the shrine of St Thomas Becket in Canterbury Cathedral and hear their stories, as told in The Canterbury Tales. The two attractions are an approximate 30 minute drive away from each other making it suitable for a combined day visit. For more information call 01795-542016 or visit www.shepherdneame.co.uk/visitor-centre/group-tours.